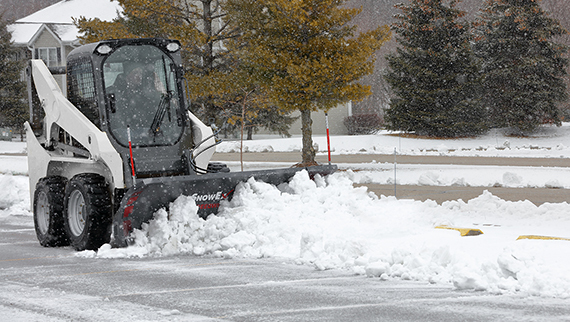 Get more out of your skid-steer with a SnowEx® Heavy-Duty straight blade snow plow or a versatile SPEEDWING™ snow plow with automatically adjusting mechanical wings. Attaching quickly to any brand or style of skid-steer loader, you can turn another vehicle already in your fleet into a snow removal hero with no additional wiring or controls. The Heavy-Duty plow provides true contractor performance under the most punishing conditions. Available in four blade widths (7' 6", 8' 0", 8' 6", 9' 0"), its heavy-duty construction combined with the hydraulics and maneuverability of a skid-steer stand up to the challenge. Available in 8' 7" blade width, the SPEEDWING snowplow combines the simplicity of straight-blade operation with the enhanced productivity that only wings can offer to maximize snow carrying capacity. With mechanical wings that adjust from scoop to windrow position when the plow is angled, the SPEEDWING is ideal for skid-steers. Provides six degrees of total side-to-side oscillation, which allows the blade to follow the contours of the pavement for a cleaner scrape. A full-trip moldboard with four coil springs helps protect you, your plow and your skid-steer when striking obstacles. Sloped forward 10 degrees, the attachment plate allows the blade to be raised with the bucket tilt function for maximum efficiency and maneuverability. Leverage your skid-steer’s onboard hydraulic system for powerful, efficient operation. Broad steps with enhanced traction provide the operator with easy cab entry/exit. Mechanical wings automatically adjust from scoop mode to windrow position as you angle the plow. Blade Width 7' 6" 8' 0" 8' 6" 9' 0" 8' 7"
Blade Height 31" 31" 31" 31" 29½"
Angle Cylinders 1½" 1½" 1½" 1½" 1½"
Plowing Width (Full Angle) 78.1"